I am not sure how many books by Seth Godin I do own, I guess that it is somewhere around 6 or 7, that I have managed to buy as a paperback editions previously and digital Ibooks editions as of lately. 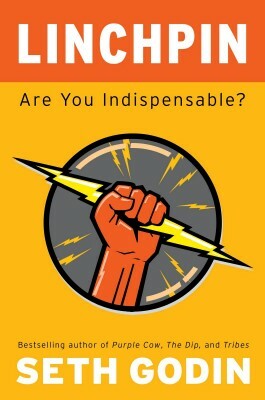 I decided to do myself a treat for this vacations and 1 day before going out with my family I have bought this amazing book called Linchpin, Are you Indispensable. As of today, not even a week later, I am already finishing this book and it was worth every penny. For a number of years I have heard a lot of opinions about it, and I was quite interested to read it, but I try to control myself & my time in order to make the best of it and so the earliest moment I have managed to lay my eyes on it is now in August of 2014. This book is about motivation for the reader to go an extra mile in everything he/she does. Everything means really everything, like even those mundane tasks that we simply do not care about. This book is targeting to bring the best of you, to help yourself becoming a better/happier version of yourself. It is about defeating the fear produced by the Lizard brain, preventing you from innovating and turning you into one more cog. But what is a Linchpin ? According to current version of Wikipedia, it is a fastener used to prevent a wheel or other part from sliding off the axle upon which it is riding. For me – Linchpin is simply something that holds important pieces together and allows you to advance, to go further above & beyond. Becoming something more is a repeating topic of dreams of every human being, doing something extraordinary is something that we have inside each one of us. Seth Godin goes into a great length into trying to define what art is and what it does. For those who knows me for a good number of years, such as Paulo Borges, they have heard me speaking me on this topic on a great length – there are people who are obliged to do whatever society or current situation are requiring, and there are artists. Artists are free to do whatever they want and like, because they can. Fear – watch this amazing presentation by Brené Brown, that as of the moment of this article writing is still in the TOP 20 most viewed presentations from TED. Go against the fear, you will still feel it but you will be feeling so much better of conquering it. There are some amazing people in Data Platform Industry that I do not-so-secretly admire, they have founded a company called Linchpin People. From a friend of mine who is not part of that company, I have heard that the co-founders spent almost a year thinking and defining what they are trying to achieve and what is the right way to do so. There are also some cases when some companies I admired greatly for years are changing their way from doing something special into becoming more … well … trivialised & expanded in the market. In his world-famous Tipping Point, Malcolm Gladwell mentioned the “magic number” of 150 when anything. Romans have had a great understanding of this number and hence they have capped any unit size below in order for people not to become a massive uncontrollable crowd which does nothing productive or logical, and in my personal experience I do agree with this principle. As for myself, I do agree with Seth and the history which shown that only those who are indispensable are able to innovate, take a look at the Innovator’s Dilemma and the corporate values. I am proud to be working with people who are sharing my inner core beliefs into trying your best and doing amazing work – OH22. Nope, this is not an advertisement, this is simply a recognition of the thoughts and efforts of my colleagues – Oliver & Tillmann.